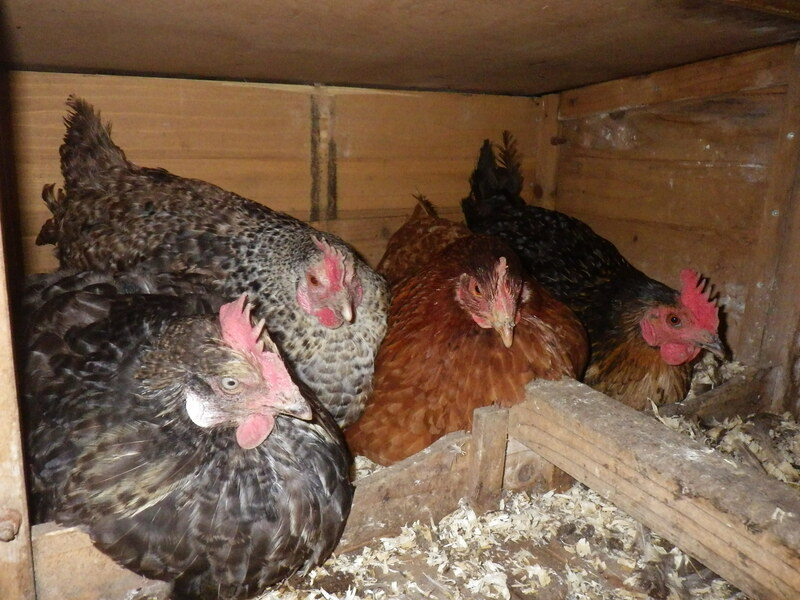 It has become very popular in the UK in recent years to keep chickens. Many a back garden, like mine, contains a small flock of hens. There are all sorts of companies selling fancy hen houses, feeders and accessories. From Eglus to gypsy caravans, you can treat your backyard chickens to grand accommodation, co-ordinated with your garden design. 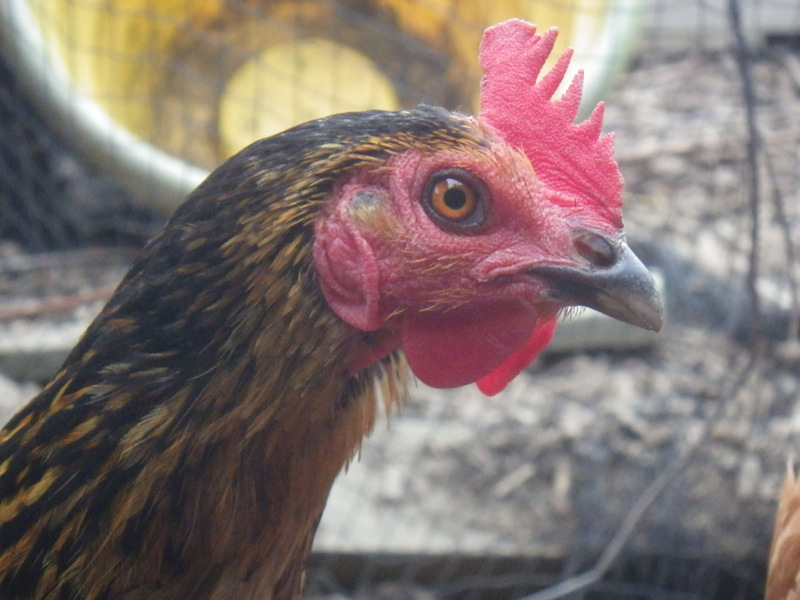 But, before you embark on keeping chickens, there are a few things that you should consider. First, they are not garden ornaments. This means that, unlike a statue, they do stuff. They poo, scratch, dig, eat things you don’t want them to, escape and poo. 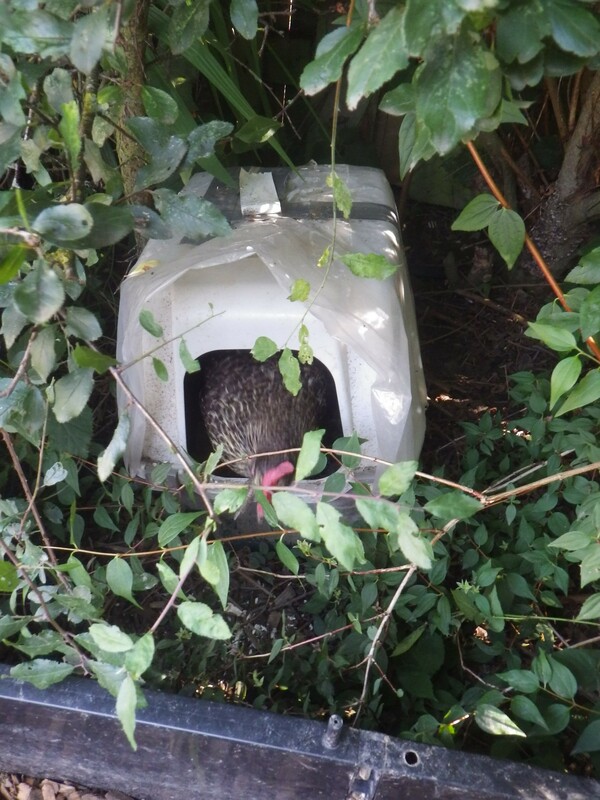 Yes, I know I mentioned pooing twice, but it’s important – you will have to clean out their housing (even if it is a gypsy caravan costing nearly £4000) and dispose of the soiled bedding; and you will get poo on your shoes, because you cannot train chickens to use a special place – hens (unlike badgers and horses) do not have latrine areas! 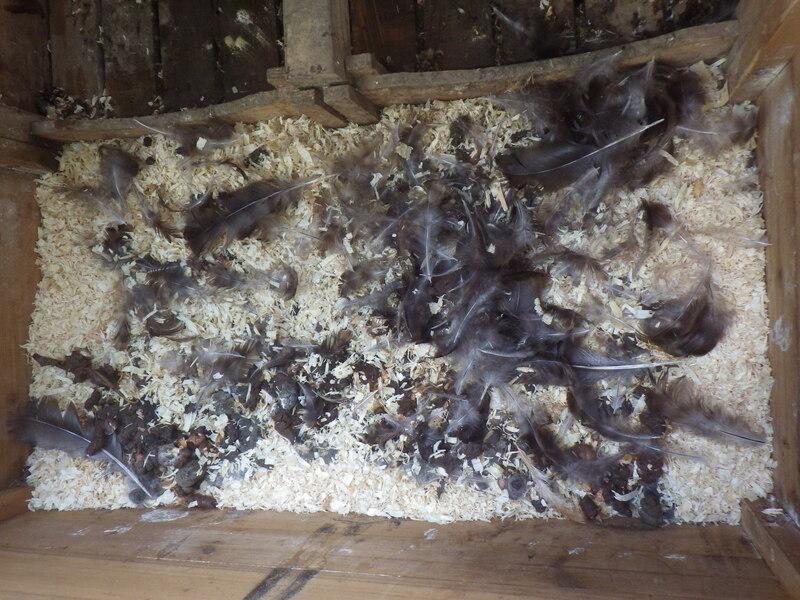 And you can’t not clean them out – just adding extra layers of bedding works up to a point, but eventually you will need to clean the house and scrub the perches. And so we come to parasites. If you don’t clean out their housing, you will find you get a build-up of parasites. 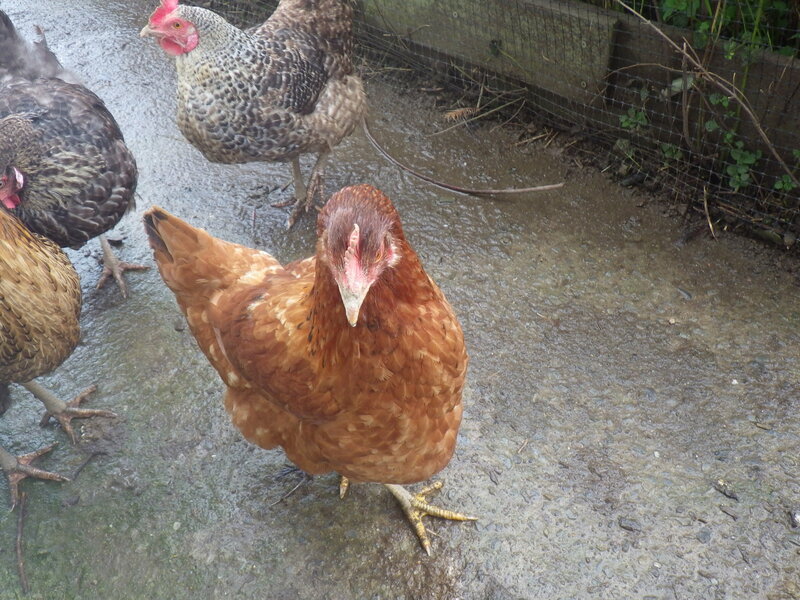 Similarly, if you have a small enclosed area for your hens, you will get a build-up of parasites. 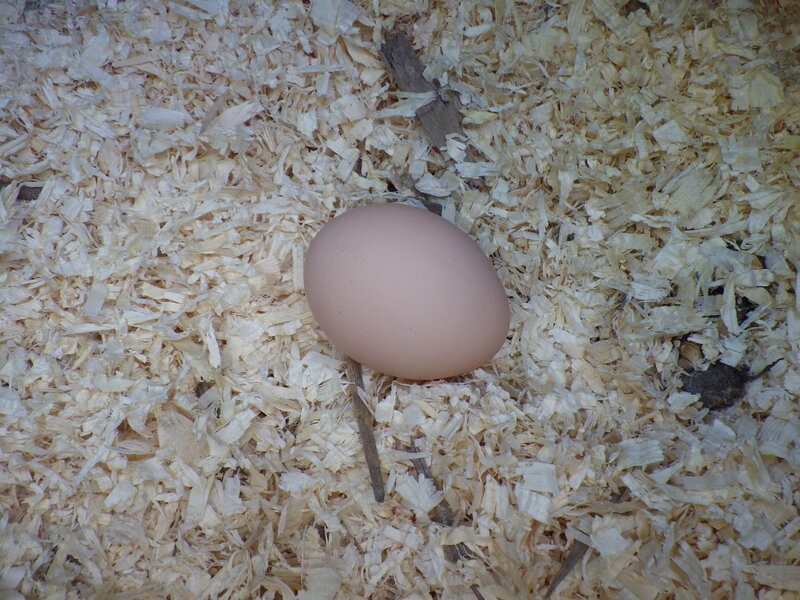 Hens that are able to range about over a wide area will have much less chance of re-infestation with intestinal worms than those that are enclosed in a small space. 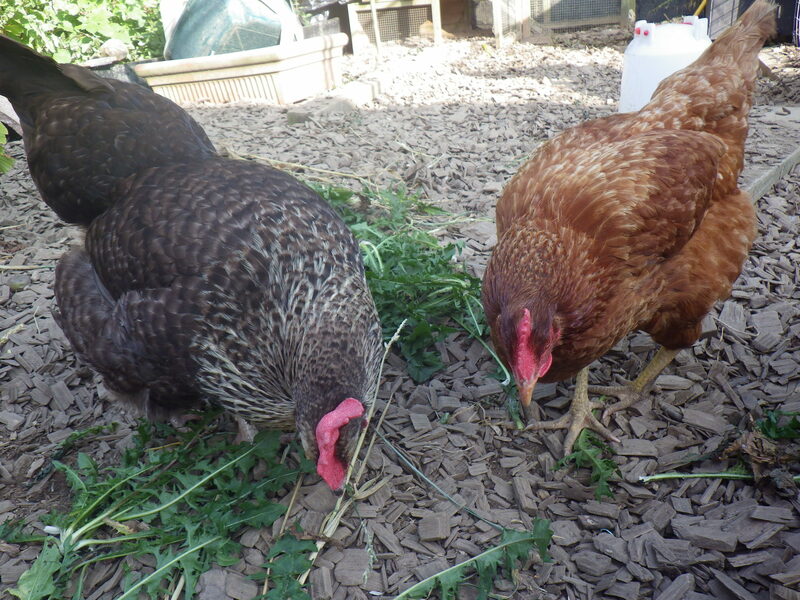 In addition, enclosed hens will scratch up a small area and turn it into mud (even if you do start with grass) and then they will be deprived of the opportunity to graze. One way to get round this issue is to have a ‘chicken tractor‘: a mobile coop/run that you reposition regularly. 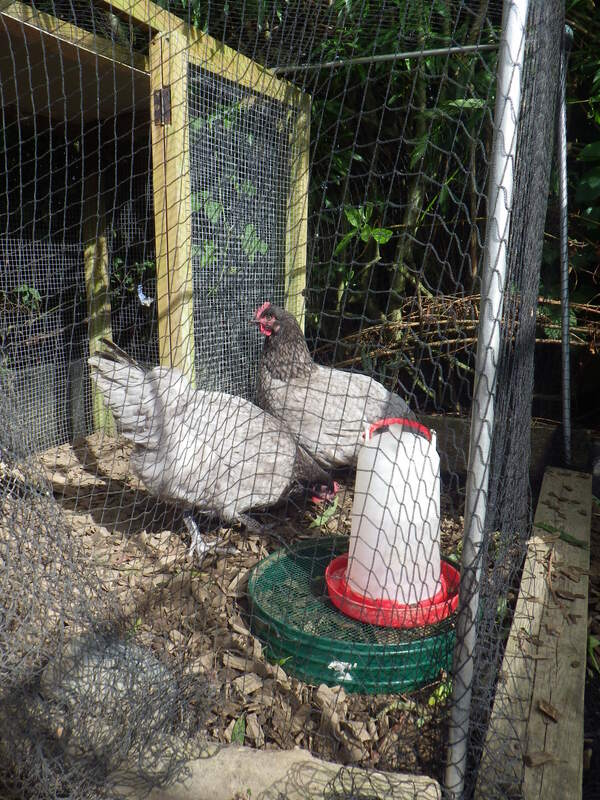 It sounds like a great idea, but they can be unwieldy to move and they tend to work best if your ground is nice and smooth as lumps and holes make them wobbly and provide ideal escape routes for determined hens. 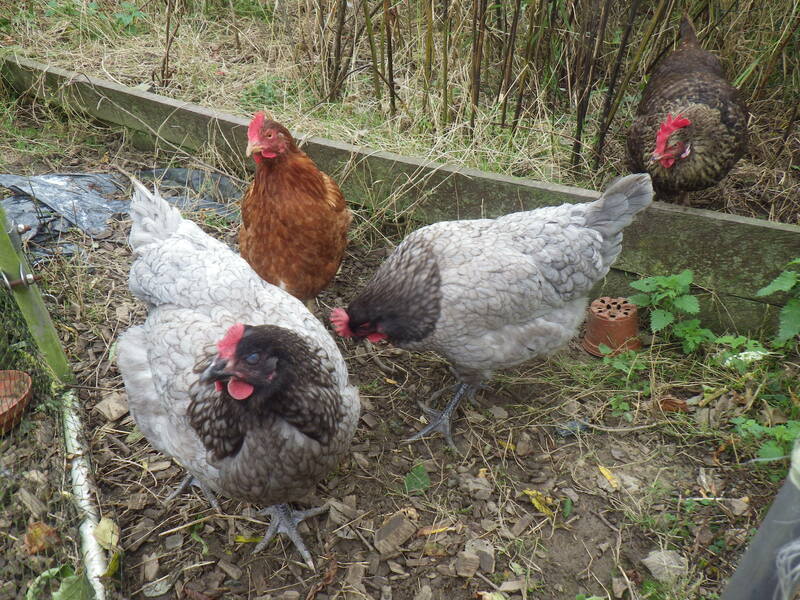 I’m not terribly keen on small pens for chickens – I think they should have room to stretch their legs and their wings, have a dust bath and go for a run if they feel like it. Ours do have a run that we can shut them in if necessary, but most of their time is spent wandering round their half of the garden, which includes the compost bins, shed and lots of hedge. Chickens are the descendants of Jungle fowl and, in my experience, they like being underneath trees and shrubs, and they enjoy rooting about in fallen leaves and in the soil building up underneath deciduous woody plants. Understanding the needs and behaviour of your livestock is important, whether they are chickens, goats, sheep or rabbits, so that you can supply them with everything that is required. 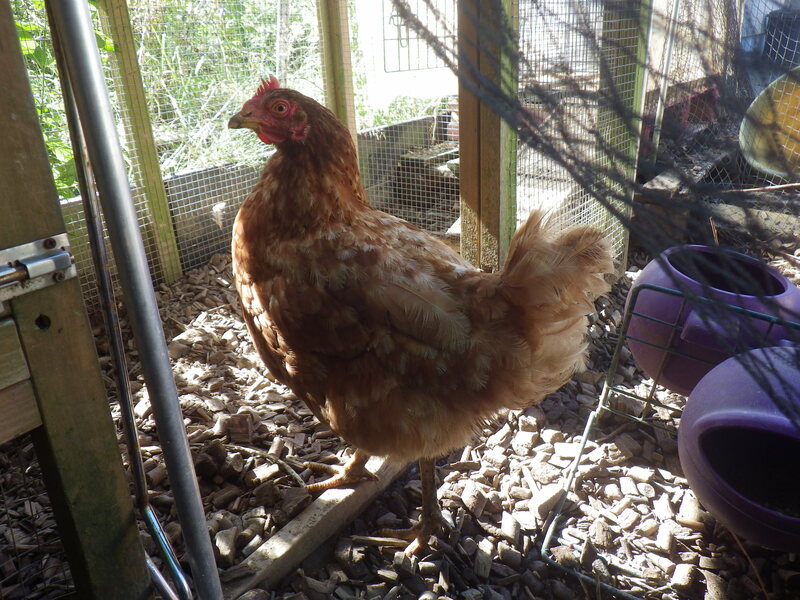 Don’t get me wrong – I love keeping hens. 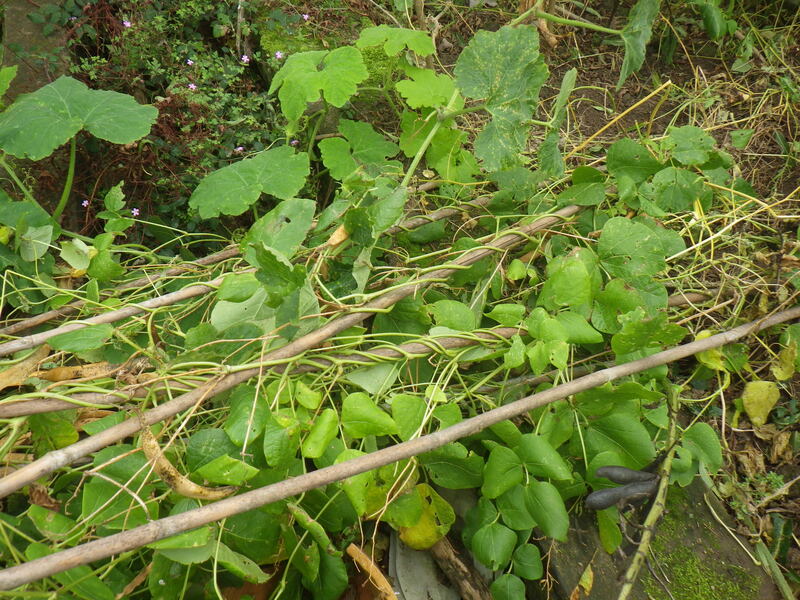 The do all sorts of things in the garden that are really worthwhile: they provide fertilizer, they eat pests (especially slugs and snails), they provide eggs and entertainment and they consume vegetable waste. By keeping hens I can be assured that the eggs we eat are from happy and healthy birds that have led a good life and have not been pumped full of antibiotics and other chemicals. And, thus, it is important to ensure that your hens do lead a good life: that you do provide for all their needs. With all livestock-keeping you take on a duty of care. And so it was that in high winds and driving rain, in the dark, yesterday evening I was hunting chickens in the garden. We experienced the remains of Hurricane Gonzalo yesterday – mainly in the form of strong winds. 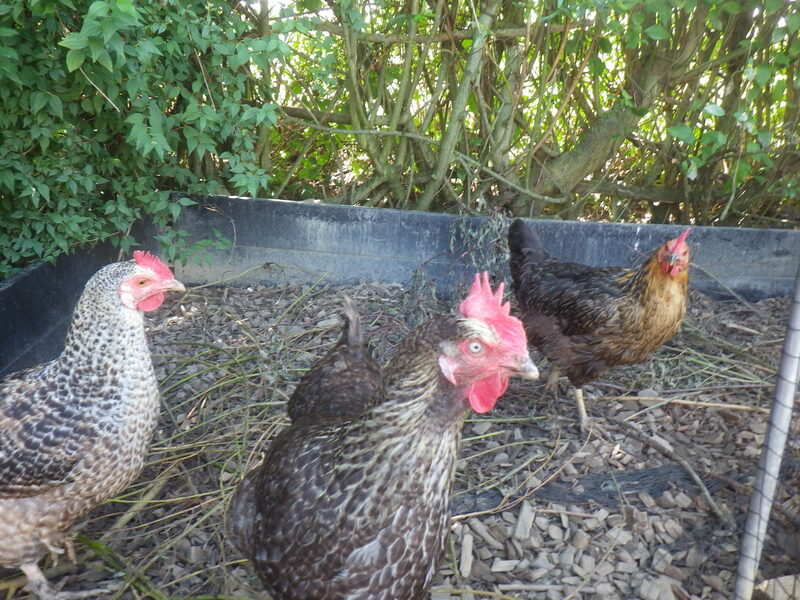 Even so, our hens were out and about and doing their normal thing, albeit with rather ruffled feathers. I kept an eye on them on and off all day just in case, but all was well. Usually they put themselves to bed at dusk and I go out a little later to close up the run and the door to the house (double security over night). So I was most distressed to get outside and discover the house door had been dislodged and was closed (that has never happened before) and a large bag of bramble prunings had blown against the entrance to the run, blocking it completely. Both these things had happened in the hour since I last checked on them and just at the time they would have been going to bed. Hopefully I looked into the house, but none of them had made it in before the entrances were blocked. So, I set off in the rain, with my torch (flashlight if you are in the US… I wasn’t carrying a flaming brand) to find the girls. Even though it was still very windy I could hear the gentle noises of roosting hens and was quickly able to locate Lorna and Annagramma in the ‘nest’ under the hedge where Anna lays every day. Although it was awkward, I was able to crawl in and extract them, one at a time, and place them safely in their house. What about the others? Not in the nest, not under the old chicken house (which was quite sheltered and dry), not tucked up by the compost bins, or in the nettle patch. Back to the hedge I went and listened again… I could here chickeny noises. Illuminating different areas, I finally spotted a hen behind the old wooden hen house and thus inaccessible without moving the structure… which I did. And there was Esme – balancing on the edging that surrounds their raised area of woodchip and runs between the old house and the hedge. I battled my way into the gap I had made and got number three out safely. But where was Tiffany? I shone my light into the bottom of the hedge but could see no sign of her. I listened again and thought I could hear her somewhere in there, but where? Hunting for a grey hen in a hedge on a dark night is not easy, but I really felt I needed to find her. At this point I want to remind you that it was raining and I was very wet. I wasn’t wearing a waterproof as, normally, shutting them in is a really quick job and I certainly wasn’t going to shred a waterproof as well as myself by diving into the prickles! More light shining, higher up in the hedge this time looking for a possible roost… and there was a patch of grey at about waist height. 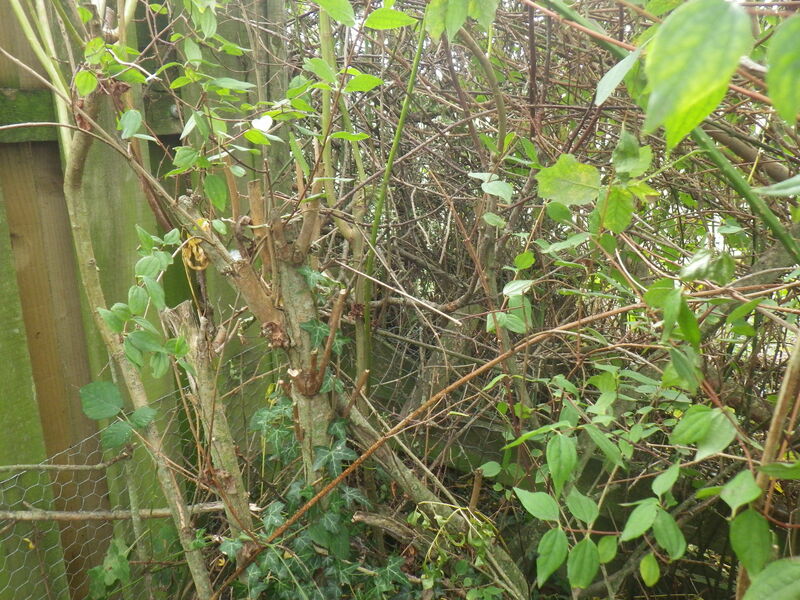 Sadly, deep in the hedge amongst blackthorn and brambles, not just willow. I fought my way in, reached out and sure enough I had found Tiffany. However, getting her out was not easy. She’s a big bird and the gaps between all the pointy things were not large. In the end I just had to reach in and grab her, hoping all the time that she didn’t struggle too much. Usually they are quite docile once they are roosting, but she was quite upset and I had to hold her firmly to get her out, but finally I had all four in the hen house. I was wet, I was scratched, I was bleeding… but my girls were safe and under cover. 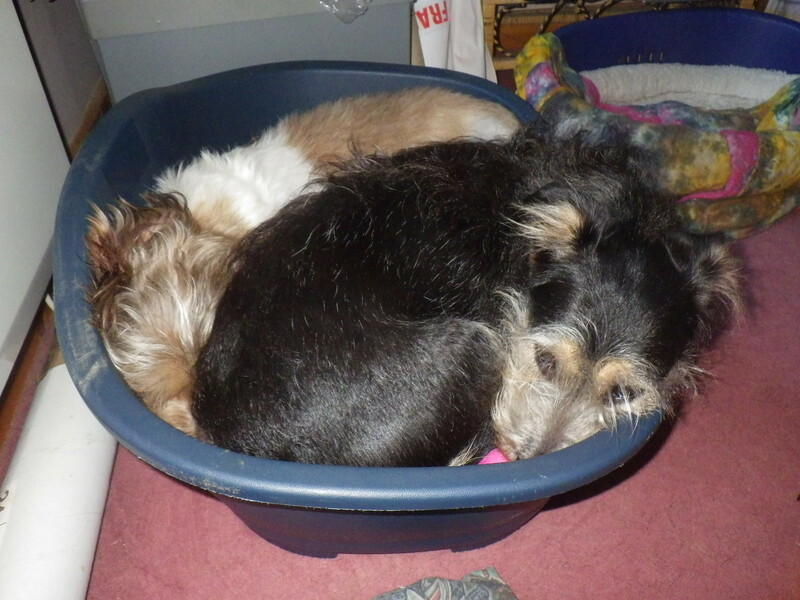 I peeked in and they were arranging themselves quite happily in the dry… cooing gently. After a change of clothes, vigorous towelling of hair and a large glass of wine, I too settled down, just without the cooing. I’m happy to report that all was fine this morning – all four girls emerged from their house with barely a feather out of place and no signs of any lasting damage – the same cannot be said for my arms and hands, which will take a while to heal. And the moral of the story? If you decide to take on animals, you have to put their needs first. You have a duty of care. You will have to make decisions about their well-being and take action, and this is likely to mean you sometimes have to do things you would prefer no to, possibly including sticking your finger up a hen’s bum and fighting your way through a hedge in a storm. And, be warned, few vets are chicken specialists! What I really want to say is that chicken keeping is great, but do your research first and make sure you are really willing to take on the responsibility. 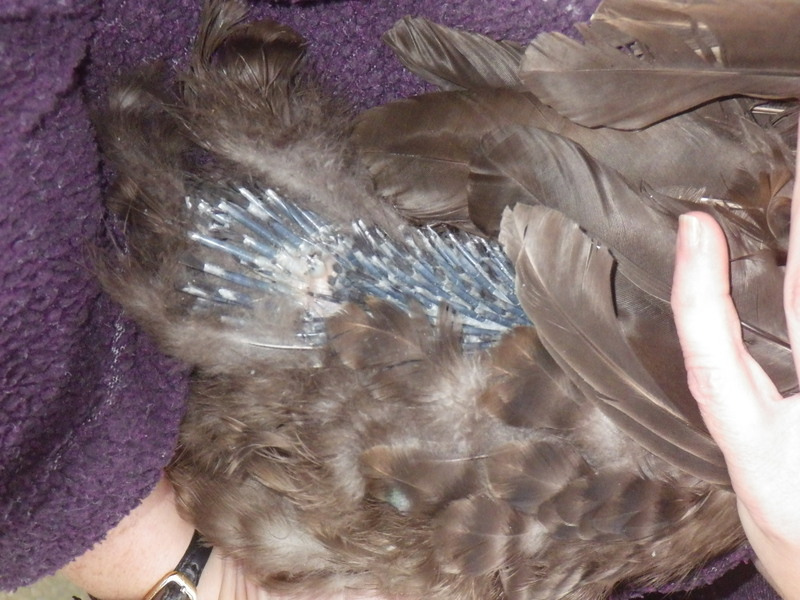 I posted last week about Esme’s sudden loss of feathers and over the week the reason it happened so quickly has become clear – the new ones were just below the surface ready to burst forth! She has been reluctant to be handled during her moult, but I managed to catch her yesterday afternoon and hold her whilst Mr Snail of happiness took a few photographs. 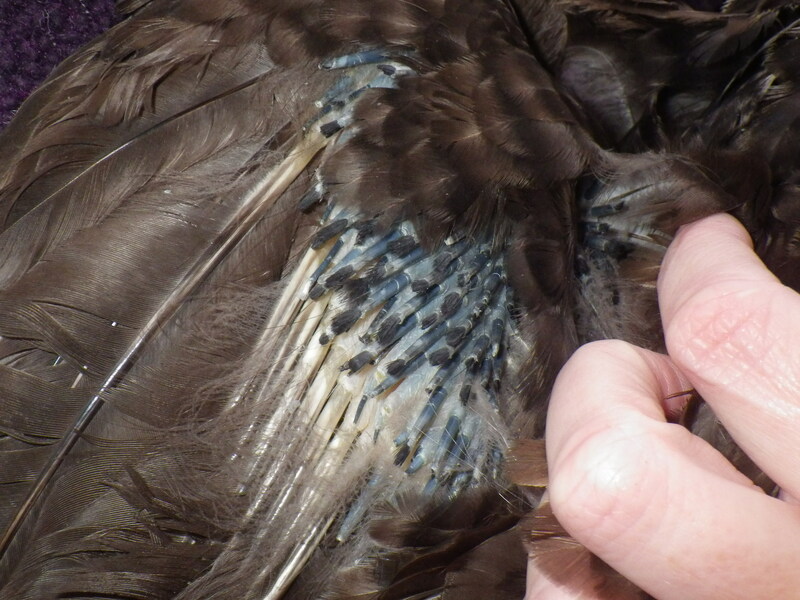 The new feathers are very prickly at the moment, resembling porcupine quills, but are coming through in great abundance. It’s interesting to see the colour contrast too – her old feathers are quite brown and faded, but the new ones are beautiful black and white. She is still losing some of her old ones, though not at the same rate as last week. It is possible that she will have a complete new set within the next few weeks. One she’s finished growing her new feathers it will be interesting to see how long it takes for her to start laying again. In the past she has always laid over the winter, but as she ages (she’s nearly four years old now) we expect her laying to decline. The two youngsters, Aliss and Perdy*, are less than two years old and are still laying every day or two. Lorna, the same age as Esme, as only ever laid intermittently, but we keep her because she does other jobs in the garden and is our top slug-hunter! 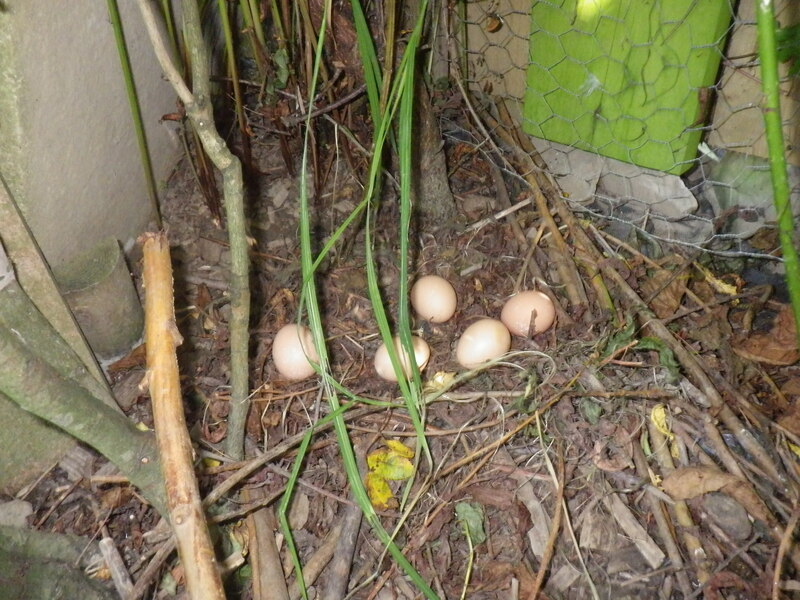 One of the joys of keeping backyard hens is to see these natural cycles taking place. We do not provide our girls with extra light or heat during the winter, so their bodies follow the seasons. This means that we are bound to get fewer eggs in the winter, but we don’t mind that, as eating seasonally is an important aspect of understanding the food on our plates. * In case you’re wondering, Esme, Perdy and Aliss are named after some of Terry Pratchett’s witches – we used to have a Gytha too. 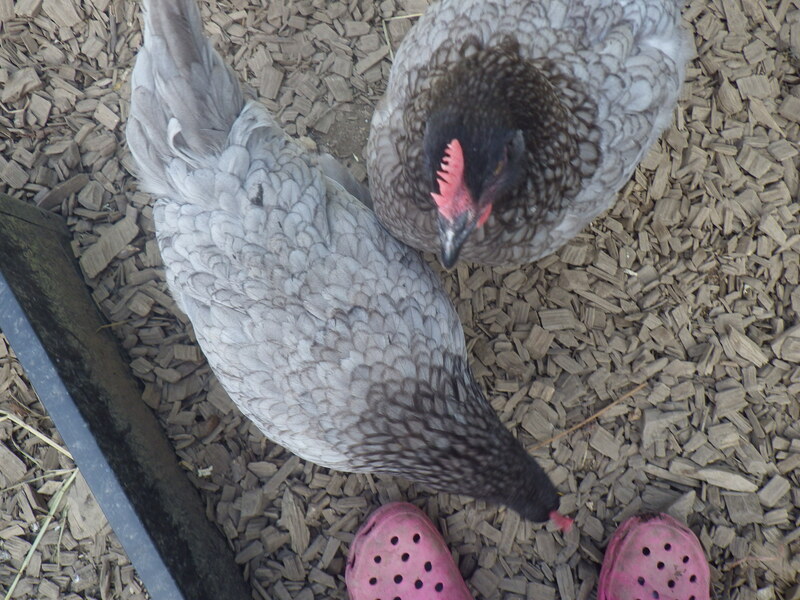 I don’t seem to write about the chickens much these days, even though they are still an important part of our garden and supply us with valuable home-produced food. Over the summer I have discovered that although they won’t eat caterpillars of the large white butterfly (Pieris brassicae), they are rather partial to those of the small white (Pieris rapae). Since the adults of these two butterfly species look so similar, you would expect the same from the caterpillars, but as larvae they are totally different. 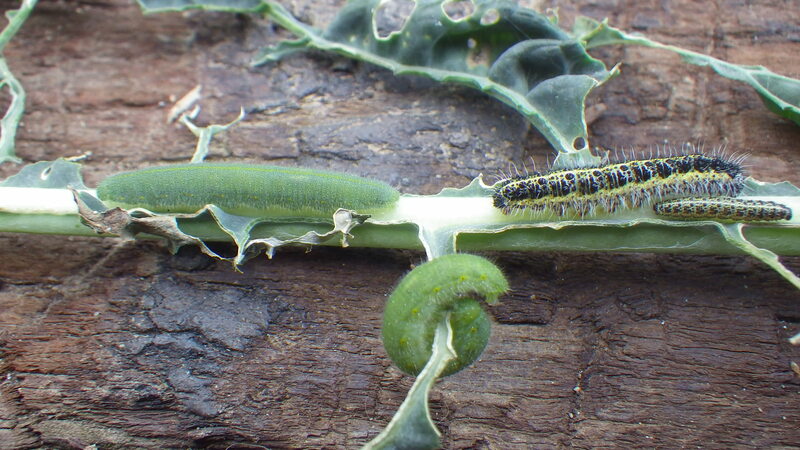 Small whites lay individual eggs that hatch into juicy green caterpillars, whilst large whites lay clusters of eggs that hatch into black and yellow hairy caterpillars that are gregarious. The chickens have the right idea – the hairy large white caterpillars accumulate poisonous oils in their bodies whilst the small whites do not. 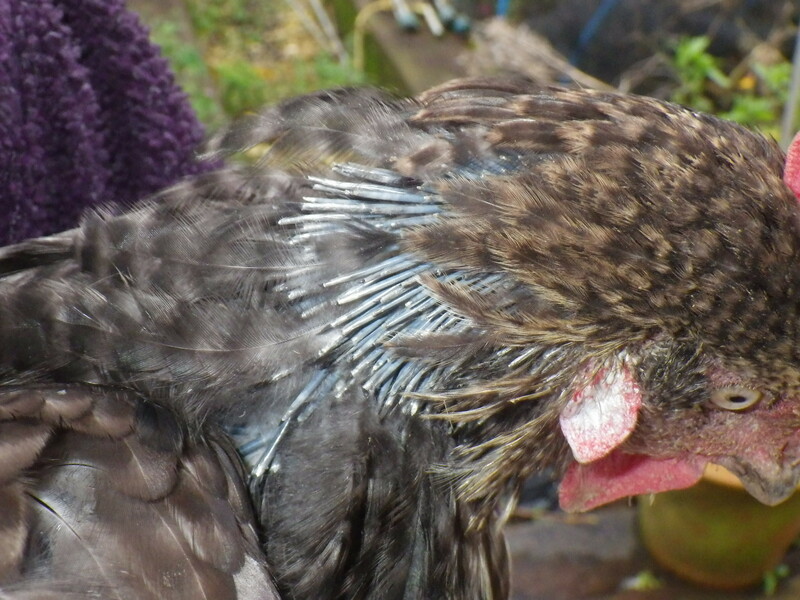 First, Lorna is moulting – there are feathers strewn around the garden, and she is looking rather scruffy. 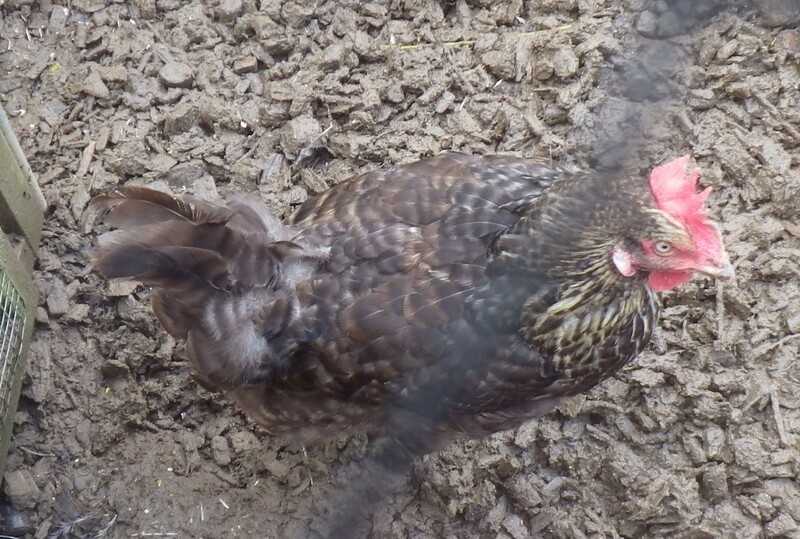 I’m always surprised that chickens tend to moult in the autumn – you would think they would do it in the summer, when the bald patches don’t matter. But, no, they wait until the temperature drops and then lose their feathers. Usually chickens only do a partial moult, but Lorna seems to be going the whole hog, meaning that she will grow new wing feathers and we will have to keep an eye on her ability to fly once more. And then there is Aliss, who is broody for the fourth time this year. She is our best layer when she’s laying, but the broodiness tends to disrupt laying for a couple of weeks. Currently I am being kind to her and simply putting her in the fruit cage every day so she doesn’t upset the others and she can’t sneak into the laying boxes, but if she doesn’t improve tomorrow, she will be in the dog crate so that she can’t make a nest and get overheated. I don’t resort to plunging them in cool water as some people do to bring their temperature down, but I’m beginning to be tempted! Actually, I really like the fact that they are able exhibit this sort of natural behaviour, it makes me feel that they are real animals rather than just egg-laying machines. 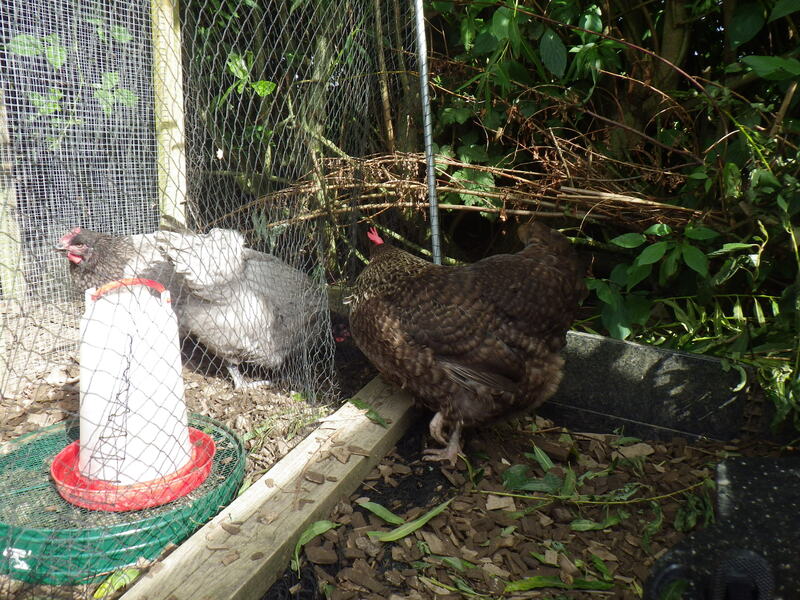 I just wish they would remember to eat when they are broody!